Joanne Sharpe has written the article below sharing her experiences in the use of 3D printing in model yacht construction. Part 2 will follow later as the project progresses. She sails at Askern Radio Sailing Club, and is one of a group of 4 at that club who own 3D printers. Is 3D printing a game changer in radio yachting? Perhaps; the jury’s still out, but it’s looking very promising. Here are some reflections on my first couple of months using this interesting building technique, which I hope help some of you to decide whether or not it’s for you. I was first attracted to 3D printing because it offers the promise of reproducing designs very accurately, +/- 0.1 mm or so, which is far better than I can hope to do in any other medium. It also gives a way of producing a hull, a rudder and some rig fittings in a week or so for under 50 quid! So, I did some research, went through the temptation stage, followed by a lot more research, then the ‘shall I shan’t I’ stage and now I’m one of four people in our club who’s got a 3D printer and are at various stages in our respective developments. My target when I placed my order for a printer was to produce an IOM, ready to sail for next spring and I’m well on target to achieve that. The hull is printed in sections. But let’s take a small step back to set the scene. My experience so far is very much a start point that anyone might take to dip a toe into this water. This is my first 3d Printer. Prices of printers have tumbled over the last year or two and I bought the Creality Ender 3, one a rash of machines that have come out of China. This is very much a basic machine and while this is not a recommendation, I’ve been very pleasantly surprised. As an entry level printer, it does everything that I want to do very well and at the price, at £150 or so, is excellent value. It took me a just couple of hours to put together and it worked first time on my very first test print. 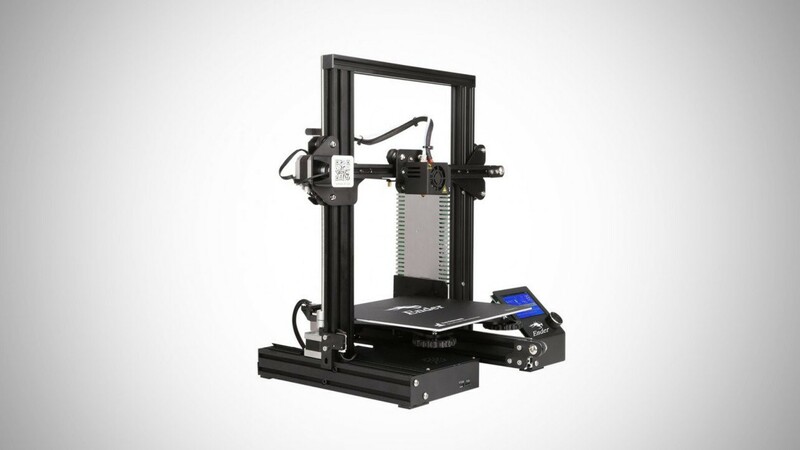 Below is a stock image of the Ender 3 and works great in its standard form, but I couldn’t resist the temptation to print all sorts of add-ons and tweaks (yep, 3D printers print themselves – look up the RepRap movement, it’s fascinating), so mine is now a bit like a Christmas tree! A very popular route into radio yachts at the moment is the Manta IOM. Andy Hoffmann in Germany has made the design files freely available (hats off to Andy) and Zach Chan in Kuala Lumpur has done a lot of good CAD work turning Andy’s design into a kit of parts that can be printed on hobbyist machines. Is the Manta a competitive IOM? Early reports are encouraging for it as a club level boat (and maybe better with the right thumbs). I liked Zach report when he first sailed his prototype in a club race … “it’s not a sticky boat”. In practice producing an IOM on a hobbyist 3D printer means building the boat in sections that will fit onto the i3 genre of machines (like the Prusa i3, the Ender 3 and dozens of others) which limit the height of sections to the range of 200-250 mm (the build height on the Z axis). It’s possible to get a machine that will print an IOM hull as a single piece, but we’re talking about kit that is outside the budget of most hobbyists, costing anything from the price of 2 or 3 professional IOM hulls upwards. There’s a lot of current discussion about sticking bits together. Most of the good, strong plastics can be problematic when it comes to chemical welding. I am very tempted to go to my favourite laminating resin, but this is the next stage for me, so we’ll see how that turns out. 3D printing is not quite an ‘out of the box’ experience. It takes a bit of testing and research to hit on techniques and settings that work for you and your machine. You have to be prepared to waste a fair bit of filament and treat it as an investment. There are times when everything goes a bit haywire at first. When you’ve waited 17 hours for a print and it goes wrong in the last couple of millimetres, you have to remember that the machine was chugging along on its own for most of that time and a one kilo roll of filament is less than the cost of a suit of DragonForce sails. Investment! Having gone through that ‘development phase’ I’ve now produced the sections of an IOM that I’m pleased with and I’ll be gluing it all together over the next week or two. Knowing what I know now, I think I can produce a lighter boat that is plenty strong enough next time. The real beauty of a printed boat is still the accuracy with which you can reproduce the designer’s intention. I’m no builder, so when the opportunity to produce prints to an accuracy of around 100 microns comes along, knowing precisely where the keel box needs to be, it’s quite seductive. As more people have got into this building method, there are some very active forums that have developed; one that I find very helpful is the Facebook group ‘3D printed radioasailyachts’. People share their experiences quite freely and there are several boats now on the water in the UK and around the globe. One hot topic is always what filament to use? Do a Google search and you’ll be overwhelmed by the choice, so here’s a starting point that works for me and many others (I will experiment further no doubt). The filament that I’ve settled on so far, is eSun PLA+ which is pretty easy to print with (I’m happy to share the settings that work for me – please ask), gives a pleasing result, gives excellent adhesion between layers and is otherwise very strong, Judging by the experience of others, this seems to give a reasonably water tight result although, it’s a thermoplastic (specifically allowed within the IOM rules), but it does mean that leaving a boat in hot direct sunshine is not a good idea. I bought CAD files as have many others because doing my own CAD work was a step too far. However, as I get further into this technique and I talk to others, the opportunity to self-design becomes ever more tempting. In a nutshell, you can print an IOM (or a Footie or an RG or up to a 10R – see below) in around 25 – 40 hours print time. Once the first couple of layers have gone down successfully and have stuck to the bed and you’re satisfied that you’re not going to get a heap of plastic spaghetti, that’s just waiting time. You can walk away and get on with your life. It’s exciting to go to bed and get up in the morning to another bit of your boat, freshly made, sat on the build plate waiting for you. Back to self-design. So, you’ve done the CAD work and turned your ‘baby’ into code and it goes on the printer. You can sail it next week and the hull has cost about 20 quid. A little less beam, a tweak to the rocker? At 20 quid for a hull, you can afford to play with your ideas, develop them iteratively and test them on the water in fairly short order. I think this is an aspect of this build technique that could become the game changer. Hopefully my Manta will be around the Northern District soon after Christmas (and I expect to see others too). You’ll be able to see how much of my aspiration has turned into reality. If you’re interested in this fascinating development, can I suggest you also take a look at a website produced by someone who’s much further down the development road than me. In Australia, Selwyn Holland is producing 3d printed radio yachts up to 10 Raters and his website at https://3dprintedradioyachts.com/ is inspiring and well worth a read. I’ll close leaving you with this thought. The scope for collaborative projects seems to be enormous. A group of people who bring a number of talents to the table might produce some staggering results and take our sport forward a significant step. I’d love to hear your thoughts.